24 hour RPG Competition - Win Amazon vouchers! In this issue, there's a Dominion Rules site update, The Free RPG Blog Dictionary reaches 100 links, I ask for your opinions on a free RPG anthology for charity, I hint about a competition I'll be running and I give some thank for feedback. News! There is enough of it to make worthy a blog entry, so feast your eyes on this diminutive list of good news. In a world so ram packed full of bad news, let's all eat, drink and be merry on a clutch of the opposite. 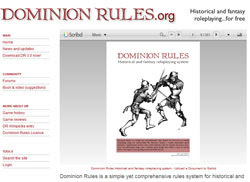 You might remember my review of the superb Dominion Rules by the Mysterious Anonymous Benefactor (MAB). If not, I will orgive you only momentarily because Dominion was a tour-de-force in free fantasy RPGs. I liked it then and even though I've read a metric tonne of stuff since, I still like it. A lot. It's with some pride and a shed full of smugness that I declare that MAB has taken on some of the comments I had about the Dominion Rules website. It now has site search and a news section as well as a forum for interest parties to put in their tuppence. It is, as I imagined, all done with an exceptionally high quality. I also hear that the next version, 3.1 will be coming soon. I wait with much baited breath. Why is this fool celebrating 100 links? You can bookmark 100 links in an afternoon! It is something of a milestone for me because these 100 links are carefully ordered, organised and thought about. Furthermore, they exist. You can click on every one of those and they'll actually be there. More static directories can't share that. So, the next target is... 200 links and as I have not finished running through the big directories, this really will not take long. 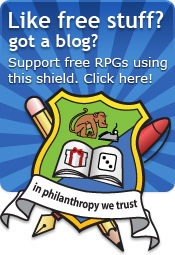 Do you think a printed, charitable anthology of the best Free RPGs is something you'd buy? Over on the free RPG Community 1000 Monkeys, Kumakami has had a superb idea: To create a Lulu anthologies of free RPGs adding a charge to go to charity. It's a marvellous idea! Would you buy such a thing? I would but I know I'm odd like that. We have no idea what games would go in it but I would check them all in detail first, create a lovely cover and we'd edit it before selling. Of course, authors will be approached and asked permission first and we would make sure that a few of us could see the Lulu account to ensure that the profit went to charity. The charity? A peaceful international one, such as The Red Cross would probably serve as I doubt the book would sell millions. Please either post your comments below or on 1KM1KT. Finally, 1KM1KT's Keeton Harrington (he's quite mad, you know) has kindly agreed to let me run a 24 hour competition in the name of this blog and 1KM1KT together. The inmates of 1KM1KT are working on the details at the moment and there will be a cash prize. Why? Because I want to try a 24 hour RPG and I like the idea of people doing it with me. When? In the next couple of months, you'll see my lack-of-subtlety advertising posters. I've been blessed with some great feedback from some community sites. Many thanks all. I will be building it into the blog over the next few weeks. The two features I think need to happen first are a better navigation (the archive is a little hidden at the bottom) and a comment system where you do not need any kind of registration. looking forward to the 24 hr RPG challenge. Awesomeness with a topping of sweetsauce. Keep up the great work. As a fan of Free RPGs and well written RPG blogs, I look forward to each new installment. I would be interested in buying a Free RPG anthology, especially if there were a few lengthier entries. I will be checking the directory out and looking forward to a contest. Ask and ye shall receive: RSS now added to the new DR web site. Thanks for the kind words gents. MAB, you're giving me very little to complain about. ;-) many thanks for the RSS. Good stuff. Keep up the hard work, I know I have been a lover of free rpgs for a long time now, and your blog keeps me interested with keen insight and reviews. I may have to partake in the 24hr RPG Challenge this year, darn you! Wow. Dominion looks great. 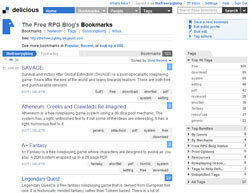 I cannot believe the generosity of so many RPG authors out on that there web... great stuff 'MAB' (why the anonymity?) and thanks for the pointer, Rob. I'm apparently completely blog-incompetent and couldn't find a link to contact you, so I'm posting here. Have you checked out the excellent old-school "Mazes and Minotaurs" at http://mazesandminotaurs.free.fr/? The conceit is "what if the designers of the first RPG were into Greek Myth and the ancient world rather than Tolkien and the Medieval period". Fun and playable, with a great community and lots of support.